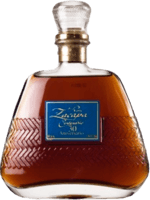 Have you found an online vendor selling Ron Zacapa Etiqueta Negra? Although most Zacapas are somehow special, this one is really special. I like the full flavour, dark oak, strong taste, all together matching and very good combined to a powerful dark rum. This is not for the romantic evening, this is for inspiring discussions and gatherings with humor and sense. The taste has more oak to it than the original 23 years Zacapa. It has a deeper/dark taste and not so sweet as the original 23y. Defently a rebuy for my Rum Cabinet. Pleasant taste, a very slight hint of smoke, typical Solera sweetness. Strange taste given by the ageing in smoked barrels. It’s a Zacapa with its wide range of flavours with this smoked note. I noted a fading of the smoked note: at the very beginning the smoked flavour was more persistent, while when the bottle was almost empty, it tasted almost like a standard 23yo Zacapa. Sweet on the nose. Smoky and spicy on the taste, the strong smoky and spicy touch from the oak is definitely a reminder for me of single malt whiskys. It has a very strong flavour but it has a really clear identity, it can be distinguished among many rums of the same kind. I find it a little expensive for what it offers but still a very good rum. Average rum. Half full half empty of taste. Used some caramel or something to fulfill the taste? I have tasted better zacapa bottles than this one!!! This rum tastes like a lot like the Ron Zacapa 23 Solera rum, but with liquid smoke added (and it's 43%abv rather than 40%). I definitely prefer the regular Zacapa 23. The smokiness is interesting, but to me it doesn't enhance this rum. Blid duft. Varmende og lækker smag når den rammer munden. Den glæder jeg mig til at smage igen. Ron Zacapa Etiqueta Negra was quite a surprise to me. I was expecting deeper taste profile and more intense flavors than the 23 year Solera aged Zacapa, but the Zacapa Negra version is actually much more smokier than I expected. I would imagine the Negra version will appeal to whisky fans, but I'm a strong advocate for proper aged dark rums with deep flavors, not whisky imitations. Struggles to make a 7 rating. In der Nase schon sehr süss, lecker nach Sahne-Karamell Bonbon das an einem Holzfass klebt. Etwas Rauch, Vanille und Blumen schwingen auch noch mit. Im Gaumen auch sehr süss fast etwas zuckerig im Aroma, überreife Früchte, Vanille, gebranntes Karamell und ein wenig Holz. Durchaus süffig aber leider auch ohne Ecken und Kanten. Schade habe gegenüber dem "normalen" RZ 23 Solera etwas mehr Komplexität erwartet. Im Abgang dominiert leider diese zuckrige Süsse immer noch langanhaltend. Auch die Rauch und Holz Noten sind noch präsent. Ein sehr süsser und teurer Rum der sicher auch seine Freunde findet. Hatte zum "Glück" nur eine Probe, ist im Moment nicht der Rum den ich bevorzuge. Beautiful mahogany in the glass. In the nose already very sweet, smells delicious like a cream-caramel candy sticking to a wooden barrel. Some smoke, vanilla and flowers also resonate even with. In the palate also very sweet almost too sugary in the aroma, overripe fruits, vanilla, burnt caramel and a little wood. Very tasty but unfortunately also without corners and edges. A pity has expected somewhat more complexity compared to the "normal" RZ 23 Solera. In the finish, unfortunately, this sugary sweetness still dominates for a long time. The smoke and wood notes are still present. A very sweet and expensive rum that surely finds his friends. Had the "luck" just have a sample, is not the rum I prefer at the moment. Stronger but very smooth taste. Better than standard 23YO Zacapa. One of my best rums. On the other hand very high price, you will definitely find same quality rums for significantly lower price. It has stronger taste (43%), but it isn't hard alcoholic taste. For those, who like Zacapa it is good choice. Trodde mycket på denna men den nådde inte upp...?. 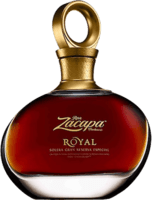 is a worthy edition to the Zacapa Centenario family of rums. Enjoyed every drop of it. A very nice rum, smooth, good taste, but for me it lacks a little bit of power to be very good. Much better than 23 solera, but has high alcohol finish. Good smell and taste but for the finish 1 point down. This rum is a good example of good marketing, and that's it. It is overpriced. Taste, I do not really like. Great expectation to try an amarotic taste. It is like Corona beer where you need to put a lime to taste it. Sorry for the one that like it. ... que le XO, du coup c'est un autre plaisir que de découvrir ce rhum qui vient de compléter ma "collection". 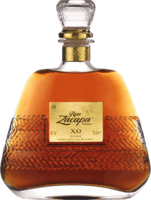 Perhaps the most distinctive of the rums from Ron Zapaca. Notes of oak, but also chokolate and vanilla.